Note: Part 1 of this article was published in Spring 2005. In contrast to the large, dramatic productions of dithyrambs, the lyric poets Sappho and Alcaeus emerge in the sixth century BCE . 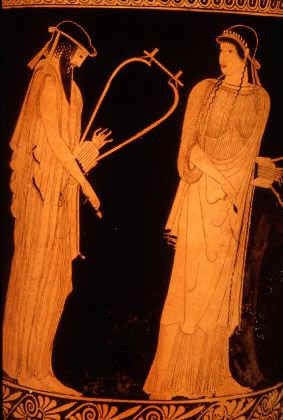 Both came from the island of Lesbos and composed their poetry-music in a personal, monodic (non-harmonic) form. Their works were very popular throughout the mainland of Greece, particularly in Athens, and many Greek poets began to identify with their lyric style. This style was known as the “Aeolian” form, and was adopted by figures such as Lasos of Hermione and Pratinas. Lasos was an important musician and poet who led the Classical Athenian style, taught the great poet Pindar, and discovered vibration as the cause of sound. Even Pindar described some of his works as being Aeolian in nature, although he also describes the same music as being “Dorian.” Because of its adoption by so many prominent Classical Greek poet-musicians, it seems that the Aeolian and Dorian styles of composing and writing represent the pure-Greek forms and contrast with the foreign styles. These foreign idioms include the previously mentioned Phrygian, in addition to the Lydian and Ionian modes (and other names that the Greeks used in great abundance). It is clear, however, that the main styles of composition in the Classical Period were the Dorian (or Aeolian) and the Phrygian forms. It is because of their prominence that Plato in his Republic records Socrates as restricting the use of modes in a moral state to the Dorian and Phrygian. In the Athens of Classical Greece we find tragic and comic drama to be the primary cultural idioms. As with poetry, drama encompassed song, music, and dance in its presentations, and the musical life of Athens therefore follows that of the dramatic productions. Because the Classical Greek drama is a direct descendant of the Dionysian dithyramb, many elements of the Dionysian dramas are evident in performances of tragedies and comedies from the 5th and 4th centuries BCE. Even the name tragodia means “goat song,” which comes from the dithyrambic tradition of including goat-like satyrs and other mythical beasts in the productions. It was also standard for the choirs of Greek comedies to dress with the beards and tails of these satyrs, also suggesting the dithyrambic roots of drama. Dramas in Athens were commonly presented in groups of four, with three tragedies and a comedy at the conclusion. The chorus of the play was supported by wealthy citizens, and the state provided actors. In general the tragedians were relatively wealthy and while they were well-schooled in music, they did not have professional musical experience. Their works did not have the musical complexity of the dithyrambs or the odes of professional poet-composers such as Pindar. However, Isobel Henderson in Ancient Greek Music makes the point that “it was a prime function of the classical comedy to criticize music as well as politics and persons.” It is natural that such comic dramatists would have extensive experience with music and could use music to great affect in their works, which also gives us an insight into the music of their times. The great Athenian comic writer Aristophanes was one of the greatest Classical composers, music critics, and parodists. His plays included parodies (in sound) of works ranging from a vast number of periods and covering many diverse styles. Henderson calls Aristophanes’ works “the epitome of the Athenian musical education.” It is the sad fate of these works, however, that only the written words of his plays remain today; all of the audible musical allusions have been lost because they were never transcribed. Fortunately, much can still be learned about Athenian music from the remaining portions of Aristophanes’ plays. For example, his plays Peace and The Clouds tell us that during the late 5th century BCE in Athens, boys of the upper class generally studied music with a music master, and all high class citizens were expected to be able to perform musical works at social gatherings. (Indeed, a Greek general was once publicly criticized for not knowing any songs to sing at such an event.) In the Birds, Aristophanes caricatures a professor of music with his character of the Poet, and in the Knights we learn about the nature of less-serious Athenian music such as the scolia, or political drinking songs. It is important to note that while these highly public forms of music created by well-known composers are the primary sources for the developments in the history of Greek music, popular musical styles relating to many aspects of Greek life had existed for centuries. These “rustic” forms of dance, poetry, and music were used by everyday people such as weavers, shepherds, craftsmen, and reapers. In the 5th century, however, true composers of “higher” music began to draw on these popular sources for inspiration and for material such as meter and melodic style. Composers such as Aeschylus, Euripides, and naturally Aristophanes all used these popular elements in their plays, with Euripides even managing to weave “the dregs of vulgar song” (such as dirges and drinking songs) into his musical works. At this time (the end of the 5th century BCE), we enter a period of great conflict and eventual revolution in Ancient Greek music. The dithyrambist Melanippides began to combine the Phrygian aulos music with the traditional Dorian styles. Because the aulos was a wind instrument, its intonation and pitches were very flexible and prone to artistic wavering, much like modern violin players add vibrato and “slides” as a musical effect. This system of bending pitch was not used in the traditional, lyre-based Greek music, but Melanippides drew these two styles together. This is something that Plato expressly forbade in his Laws when he rails against musicians who blended the different forms of music together. Even with the complaints of Plato and many other traditionalists, a new style of music, one that includes modulations between different modes (such as Dorian, Lydian, and Phrygian) and new tuning systems, tears across Greece towards the end of the 5th century BCE. It is important to remember that Greek music, like drama and poetry, was highly sensitive to political and social settings. These musical revolutions came at a crucial time in Greek history, as the Peloponnesian War reached a tremendous close in 404 BCE. Athens was the great loser of this drawn-out conflict, and the Athenian cultural life certainly reflects this political upheaval. So much of Athenian culture was subsidized by the state, and as the War draws on, the official choirs and drama productions are limited because of lack of money. Comedy, which required a large chorus of 50 to 60 people, lost much of its funding. Because comic drama was an excellent source of music education throughout Greece, limiting it and other education sources caused a lessening in the musical schooling of Greek citizens. With a less musically astute public in the years following the Peloponnesian War, audiences become less critical and support for the Classical, traditional style weakens. This in turn leads to a further increase in the use of popular music by professional composers. It also causes many performers to use virtuosic and extroverted, flamboyant techniques to improve their popularity, and the traditionally more conservative styles are laid aside. However, much of the middle class of post-War Greece turn away from this new, populist style. Because the new middle class itself is less musically educated, this simply lowers the esteem and strength of music as an art form (becoming more of a simple entertainment), and causes a reduction of music criticism. Athens had a unique cultural place among Greek states, especially in music; most Athenians both practiced and listened to music. This was not as common in other cities, and after the fall of Athens in 404 BCE, many asked if perhaps only the professional performers should practice music, as was common in Sparta, the victor over Athens. The next generation of musicians after Melanippides and his contemporaries Phrynis and Cinesias were the famous dithyrambists Philoxenus and Timotheus. These composers disregarded the entire Classical past by constantly mixing modes and styles and adding new sounds such as those of differently strung lyre-like instruments and extreme modulations. A remarkable occurrence happens shortly after the era of these composers: “The iconoclasts soon became the new idols,” as Isobel Henderson states it. She goes on to claim that “Timotheus and Philoxenus eclipsed both their predecessors and their posterity.” Not only is this significant because a tremendous populist and virtuosic revolution has occurred in Ancient Greek music, but the composer and performer in antiquity have reached their highest point before the Middle Ages. Immediately after Timotheus and Philoxenus become the new standard for Greek music, a great shift takes hold in which music from the past begins to be venerated above newly composed material. This marks a change for the first time in a musical culture in which only the very latest works were tolerated, and has a tremendous effect on musical thought throughout the Hellenistic Period, the Roman Republic and Empire, and the Middle Ages. People now preferred old, familiar pieces to new and experimental works. Henderson tells us that “the new style had become conventional,” and modern works were just a kind of repetition of the masterpieces of Timotheus and Philoxenus. Unfortunately this musical stagnancy led to a great decrease in the power of music in general during the next eras of history. Music no longer was an integral, essential part of the culture as it had been in Archaic and Classical Greece. It is ironic that during the greatly innovative Hellenistic Period so many contributions were made to science and technology, but music hardly “develops” at all. It is reduced to more of a pleasant, accompanying, background role, and the great and powerful works of the Classical Age are simply memories. During Hellenistic times, however, we find the first examples of musical notation developing. Much of our knowledge of actual Greek compositions comes from these documents. It is sad that this greatly significant development of notation comes after the zenith of music in Ancient Greece, or else the Greek musical tradition would not have been so displaced from the music of later ages.